It's easy to find 3 great meals a day on Isla Mujeres, off the coast of Cancun, but who knew we should even try to? Isla Mujeres is a peaceful, still unspoiled island in Quintana Roo, Mexico, only a few minutes’ ferry ride from bustling Cancun. It is known as a great family destination, due in no small part to its calm, shallow waters that are perfect for children to enjoy a safe swimming environment. During a recent stay on Isla at the wonderful Na Balam inn, my family and I discovered that it has a blossoming restaurant scene. Locals as well as the many foreigners who have moved to the island (and now call it home) are running economically-priced restaurants that feature a variety of cuisines. Families will be happy to know that the island is full of casual, kid-friendly choices, and we — devout foodies from New York — never spent more than $12 per person on a meal. Tiny Isla Mujeres is making a well-deserved mark on the budget-friendly restaurant map. Between hiking and swimming, we only had time to eat three meals per day, but here are some of our favorites. We found two really good breakfast places to start our day. Our favorite was right at our hotel, the lovely Na Balam, located on Playa Norte, the island’s most beautiful beach. At around $10 per person, continental breakfast was pretty expensive by island standards, but it was copious. It includes yogurt with delectable homemade granola, a fresh tropical fruit platter, a basket with freshly baked breads, fresh squeezed orange juice, and a great bottomless cup of coffee. The Na Balam’s cafÃ© is perfectly positioned to enjoy its gorgeous ocean front location. As hotel guests, it was a convenient choice for us, but many patrons come to the Na Balam from all over the Island, to enjoy this well-known treat. In town, we had a good breakfast at Elements of the Island. Although it doesn’t have the Na Balam’s views, it does offer a well-regarded yoga class each day at 9am. Many students stay after class to enjoy the organic breakfast that is served with homemade jams; my 14 year-old daughter and I did just this. Its friendly owners are long-time island residents, who teach the yoga classes as well as run the cafÃ©, which is open from 7:30am until 1 pm, every day but Wednesday. We ate lunch at the island’s Mercado on most days, located a few minutes’ walk from Playa Norte. This municipal market features several stalls called loncherias, run by families working together. We sampled lunch at most of the stalls, and found the food tasty and the experience authentic as we dined with a mix of tourist and locals. The kids enjoyed the pureed fruit drink called licuados, in a variety of tropical flavors. Midday is a good time to explore the island. Families with young children will appreciate that Isla Mujeres is small enough to traverse by golf cart, so no worries about traffic. Golf carts can be rented all over the island, and it’s a fun way to transport a family. Families who enjoy picnics may want to bring along their own take-out containers, as the Mexicans typically eat their meals outdoors at tables near the stalls, rather than taking food away with them. Our favorite midday meal was at Playa Lancheros, a pretty beach located on the island’s Caribbean side. 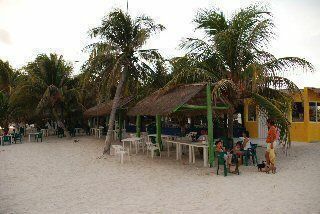 We loved this very casual beachfront restaurant, where locals enjoy their comida, or main meal, served at around 3pm. 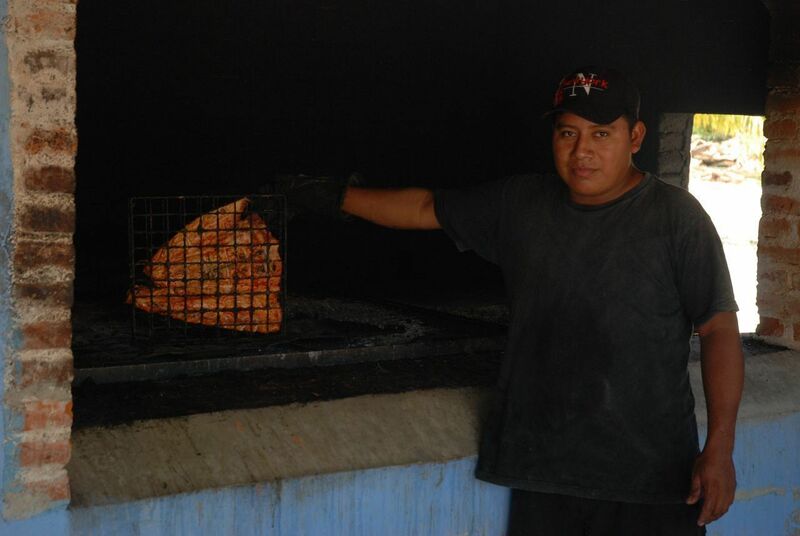 The house specialty is a Mayan-style grilled fish, cooked in a sort of smokehouse a few steps from the restaurant. The locally caught fish is rubbed with a mixture of Mayan spices that give it an orange tinge, and a delicious mild flavor. Nearly everyone was eating this house specialty, but the accommodating staff indulged my fish-adverse daughter with a plate of rice, beans and chicken. While we waited for our meal, we took a refreshing dip in the ocean. 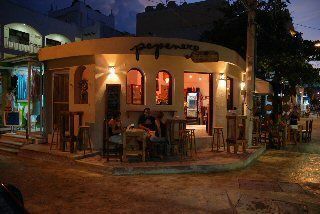 What’s For Dinner on Isla Mujeres? For dinner, we strolled the pedestrian-only main streets of the pueblo, seeing what appealed to our senses. 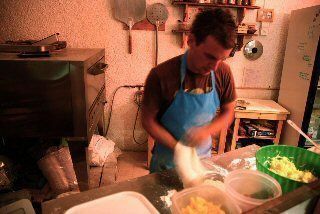 We found Pepe Nero (998/817-3924), a pizzeria run by a charming young Italian couple from Vicenza. Mattia is the chef and Silvia runs the house. The pizzas are authentically Italian, and each one is enough for two hearty eaters. My children would have been pleased to dine here nightly (it is closed on Mondays), but my husband and I craved variety. We had a great dinner at Velazquez, one of many fish joints that line the port. We liked the look of it, as the tables are set up on the sand, right at the water’s edge, where fishermen bring in the day’s catch. We enjoyed its Margaritaville ambience, coupled with really fresh fish. 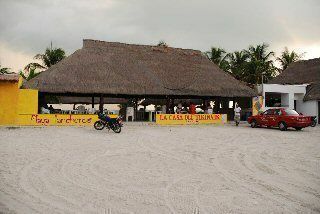 It is owned and staffed by the Velazquez’s, a local family who opened for business 25 years ago, when Isla Mujeres was still considered a remote tourist destination. We finished our tasty meal, and our waiter told us that the restaurant has a tradition of offering complimentary tequila to first-time customers. We gladly accepted this offering. He quickly brought out two shot glasses, mine filled with a pink liquid, which he banged down in front of me. I was surprised when it started bubbling over, and our waiter chanted go, go, go, and I downed it. My husband’s blue liquid tequila was brought to him, with similar treatment. Our waiter explained that this tradition is a sound one, as the tequila aids digestion. We felt great after our meal, so it worked for us. But the true culinary find was Mango CafÃ© (998/230-8984). The owner’s of Pepe Nero told us about it, and we decided to check it out. It is located in the Mid-Isla neighborhood, just off the tourist track, across from the Iglesia Gaudalupe. It requires a golf cart, or a $2 taxi ride to get to. 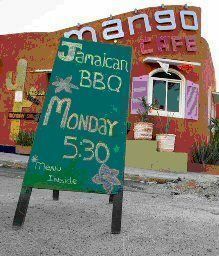 We ate there on our last night, a Monday, which is the weekly Caribbean BBQ. If it had not been our last night in Isla Mujeres, we would have eaten every meal there. Using predominantly organic ingredients, husband and wife team Lori and Polo, she from Wisconsin, and he from Oaxaca, are creating such a buzz that Mango CafÃ© is becoming a destination restaurant, attracting people from Cancun to make the worthwhile trip for a great meal. Polo is the chef, and Lori the visionary, who runs the house. Lori is an artist who transmits a passion for good food and an eye for detail into every corner of available space. Brightly and festively decorated in a traditional Mexican palette of bright colors, we felt instantly welcomed, like guests in Lori’s home. I felt like I was in the presence of a young Alice Waters, for serving fresh, delicious food is clearly a mantra for Lori. Every guest’s dining experience is important to her. She let us know that although Monday night BBQ is a set menu, as the sympathetic parents of a 10 year-old daughter, they would be happy to prepare my kids something else, if the set menu didn’t appeal to them. The inventive kids menu offers young diners choices like peanut butter and jelly empanadas, and BBQ chicken pizza. They are equally accommodating to vegan guests, as they can substitute soy for many of the meat-based dishes. The evening’s menu, featuring chicken with a tropical salsa, was a hit with all four of us. The side dishes, tamarind baked beans, three potato salad, and crunchy coleslaw, were all packed with a delightful variety of flavors. A pitcher of fragrant hibiscus margaritas accompanied the meal. Dessert was a warm caramelized apple, topped with vanilla ice-cream, that made me want to lick the plate, to get every last drop of sauce. We considered ourselves lucky to have found Mango CafÃ©, but wished that we were not leaving early the next morning, as the breakfast menu was tantalizing. We will have to wait until our next visit to try the berry chai pancakes with ginger-cardamom syrup, served with organic Oaxacan coffee. Friday’s Caribbean fish fry, using freshly caught Island fish, peaked my interest too. In November, 2009, they are expanding with the opening of the Blue Iguana Deli and Market, just across the road from the CafÃ©. The menu will feature light fare and Lori is working on a list of homemade baked goods. We expected to find beautiful beaches, and decent, inexpensive food on Isla Mujeres, but Mango CafÃ© surprised us, with a world-class meal that would stand up to what is served in any restaurant, anywhere. The Mango CafÃ© is clearly a labor of love. We lucky diners reap the benefits of Lori and Polo’s talent and dedication in every mouthful. Made my mouth water. A great piece. Can't wait to return to discover the places you did and we didn't.